In a shocking pro-euthanasia campaign released on Wednesday, French president Nicolas Sarkozy is portrayed as a dying patient in a hospital bed in an effort to convince him to change his current stand against the legalization of euthanasia in France. 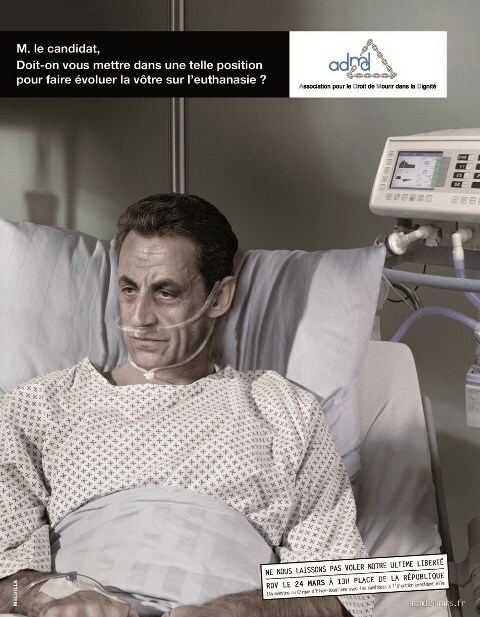 French president Nicolas Sarkozy appears in a photoshopped image that shows him in a hospital bed. The ‘Association pour le Droit de Mourir dans la Dignité’ (Association for the Right to Die with Dignity , also known as the ADMD) , which represents pro-euthanasia supporters, launched the controversial ad campaign in the French weekly Les Inrockuptibles to promote assisted suicide for terminally-ill patients. In recent months, euthanasia has become a key issue in French presidential elections. The debate on euthanasia in France came into the spotlight in August 2011 after a hospital doctor was charged with helping four elderly patients die. Most French people support euthanasia. Polls have found more than nine people out of 10 (92%) in France support a law allowing euthanasia for those with incurable illnesses. Currently, assisted suicide is illegal in France. ( Watch this France 24 video , which explains the current situation of euthanasia in France). You may ask- Why is Socialist candidate François Hollande not depicted in the campaign as well? The ADMD says it spared Hollande because he has actually voiced his support for assisted suicide. The ADMD plans a public demonstration on March 24, where presidential candidates are invited to attend.